The Internet is full of free wallpaper sites. This sometimes makes it hard to find the best Linux wallpaper. I've done the legwork for you. Freshen up your Linux desktop with these great wallpaper! Wallpaper generally comes in the form of a simple image file. As a result you can pickup great wallpaper from just about any wallpaper site on the Internet. Being Linux users though, we want wallpaper that has the Linux look and feel. Here are some great sites and blog posts with wallpaper specifically geared towards us (Linux users). Many of these include the logo of your favourite distribution, others focus on tux the penguin and many are simply creative pieces of artwork. Deviant Art is one of the more popular websites for all things artistic, including wallpaper. The website is used by artists to showcase their work and while you may find some horrible art there you will find a lot of quality work. A simple search for Linux Wallpaper and you'll be clicking for hours before you know it. Probably the most popular site for Ubuntu Linux customizations is gnome-look. You can find themes, icons, fonts, screensavers, wallpaper and more at gnome-look. New wallpaper is added by gnome-look users on a regular basis so check back often for some great Linux wallpaper. The KDE desktop environment also has its version of gnome-look called kde-look. Much like gnome-look you can find all sorts of KDE customization options, including but not limited to, icons, themes and wallpaper. All artwork is submitted by the kde-look users and updated frequently. Found via search engine during my quest for the perfect Linux wallpaper for my desktop a couple weeks ago, this blog post over at Best Design Options lists and links 25 fabulous Linux wallpaper. 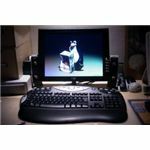 Many include Tux the penguin, others poke fun at Microsoft Windows and all would be a great addition to a Linux machine used for entertainment. During the same search as above I stumbled upon an article by Ariela Ross at designora.com, called "The Best of Tux: 75+ Wallpaper Designs Featuring the Linux Mascot", in which she lists 75 of her favourite Linux wallpaper that include Tux the penguin. I had no idea there were so many fantastic Tux the penguin wallpaper! I downloaded and archived several of these Linux wallpaper for future use. This Linux news site frequently has posts linking Linux wallpaper. These posts have included; The Coolest Linux Wallpaper, Fresh and Cool Linux Wallpaper, and my personal favourite, Minimalistic Linux Wallpaper.